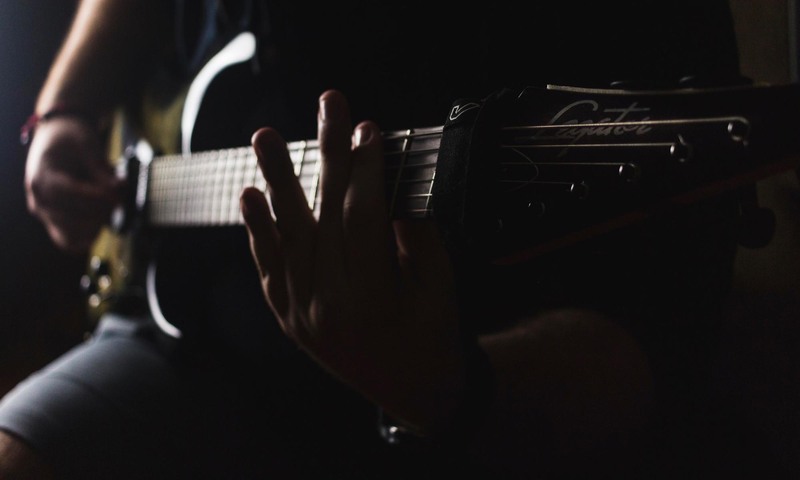 Featuring two very well known Guitar Solos, Comfortably Numb, from Pink Floyd’s The Wall, is a great song to learn to play… just takes a little work at first. From their 1979 record entitled The Wall, Pink Floyd’s Comfortably Numb features two very well known Guitar Solos, and it’s legendary for having caused huge arguments between band members David Gilmour and Roger Waters. For the Guitar Solos and heavy bits, David Gilmour uses an Electro Harmonix Big Muff Fuzz pedal and some delay. He’s using a black Fender Strat with a Charvel maple neck through a Hiwatt DR103 100-watt amp and there’s a little bit of rotary speaker blended in. The Rhythm Acoustic section uses an Ovation Guitar with Nashville Tuning. The E, A, D strings use the high ones from a 12-string set and are tuned up an octave. The final Solo was pieced together from several Solos that were recorded for the song. This song is in the key of B Minor Aeolian, which is a mode of the D Major scale and both scales share the same notes. We can see here that the chord is a basic B Minor in the second position, which is also the Key of the song. Here, we can see that we start with the same B Minor chord that we use in the Intro before moving to an A Major. We then move to a G Major chord and finally to an E Minor, but with a passing tone of F# between them. This sets us up with a I-VII-VI-V-IV-I (1-7-6-5-4-1) progression. B-A-G-F#-E-B. For the Chorus I tabbed out the keyboard melody because I noticed most other sites do as well. We will break it up into a few sections to make it easier to look at. We can see here that the progression goes from a D Major chord to an A Major, which results in a I-V (1-5) chord progression. The arpeggiated notes that the keyboard plays over the D Major chord contain the notes D, E, F#, A, from low to high. The keyboard plays all of the notes from the D Major chord and adds an E note, which gives the bar a D Major 9th feeling. The arpeggiated notes that the keyboard plays over the A Major chord contain the notes C#, D, E, A, from low to high. In this bar the keyboard plays all of the notes from the A Major chord, but this time adds the D note, which is the 11th. We can see here that we are using a C Major chord followed by a G Major, which creates a I-V progression just as with the first part. The first thing that we might notice is that there is no C note in the B Aeolian/D Major scale that this song is in. This is because we need to change keys and move down one whole step to play in the key of A Aeolian/C Major for this section of music. Just as with the last section, but moved down one whole step, the arpeggiated notes that the keyboard plays over the C Major chord contain the notes C, D, E, G, from low to high. The keyboard plays all of the notes from the C Major chord and adds a D, which gives the bar a C Major 9th feeling. The arpeggiated notes that the keyboard plays over the G Major chord contain the notes B, C, D, G, from low to high. In this bar, the keyboard plays all of the notes from the G Major chord, but this time adds the C note which is the 11th. You can see here that we are using all Major chords A-C-G-D with a B passing note between the A and the C chords giving us a I-II-III-VII-IV (1,2,3,7,4) progression, with the final D Major chord establishing our return to the B Aeolian/D Major key. We will tab the solos in a future article, but here’s a look at the chords behind them and the scales that they are in. Once you have learned the above parts, you should be able to play the whole song.